Donald Trump’s exhortation of “America First” and all the debate around NAFTA might have some in the travel industry wondering: how does this affect me? 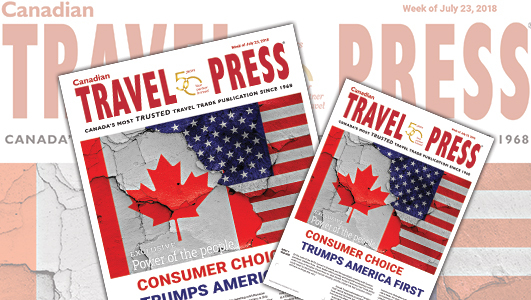 Quite likely much more than you think, writes Brett Walker in an exclusive commentary in this week’s digital edition of Canadian Travel Press. While few, if any of us, will have a smidgen of influence on any future trade agreement; tourism as a whole plays a very important role in trade. Yet, your industry and mine, our business interests and our personal and collective futures are rarely mentioned in any political or even economic discourse. Perhaps because of this fact, or in light of it, the media has yet to engage with issues related to it. Though previous US administrations have taken exception to some of NAFTA’s perceived inequities, none have been so emboldened to denounce, not only NAFTA, but the notion of free trade itself. The pointed attacks and subsequent tariffs by President Trump on Canada’s aluminum and steel industries are sure to have a stifling effect on Canadian manufacturers. Trump’s invective is now focused on Canada’s dairy farmers which, he believes, are advantaged from a protectionist and anti-competitive supply management system. On this he could be right; although there’s no mention of the tens of billions of dollars of direct and indirect subsidies US dairy farmers receive from the US government every year.